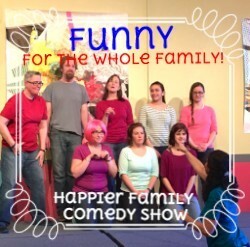 The Happier Valley Comedy Show is on the second Saturday of every month at 8pm in Greenfield, MA providing a full evening of improvised entertainment featuring The Ha-Ha's and special guests from Boston and beyond! "More Improv, More Better Jam & Showcase." ​Everyone (even you!) is welcome to play easy-to-learn improv games in our jam and also to sit back and watch a short set featuring Advanced Improv students from Happier Valley Comedy School. Best for kids 5-11 years old and their adults.